Spanish exile in Palestine, author and cabalist of the early part of the sixteenth century. He was brother-in-law of Abraham Zacuto, the author of the "Yuḥasin." On being exiled from Spain, 1492, he lived for a brief period in Egypt and Constantinople. Subsequently he went to Jerusalem and Safed, where he studied the Cabala. At Jerusalem he was admitted to the school of Samuel Misod of Safed and Jacob ben Mani. In a letter sent by the bet din to a philanthropist, his name stands at the head, showing that he was the ab bet din. Later he was appointed head of the school of David ben Susan. His courageous attitude is manifested in the responsum to Isaac Sholal—at that time nagid of Egypt—on the question whether it is allowable to pray to the angels. Therein he strongly opposes those cabalists who, as he says, "while leaving the path of righteousness to go into the paths of darkness, serve idols, but not the Lord God." Of certain old customs, he says: "These are not usages, but . . . Pay no attention to what is found in treatises written by unknown men; for many falsifications are found in them." On inquiries into dreams, which often occupy the attention of the cabalists, based upon I Sam. xxviii. 6, 15, he says: "Deep thought and exaggerated imagination suggest to you sometimes a Bible passage, in which the anxious mind accidentally finds an answer." He wrote a commentary on the little book called "Nebuot ha-Yeled" (The Prophecy of the Child), attributed to an imaginary person named Naḥman Katofa and said to have been found in the ruins of the city of Tiberias, written on old parchment and hidden in an earthen jar. The meaning of this manuscript was very obscure. The commentary was published in 1516. Abraham is also the author of "Mashre Ḳiṭrin" (The Untier of Knots), Constantinople, 1510, a commentary on the seventy weeks of Daniel's prophecy (Dan. ix. 24-27), a subject treated also in "Nebuot ha-Yeled." According to Abraham's explanation, the year of redemption should have been 1530. He also wrote "Tiḳḳune Shabbat," mystical reflections on the Sabbath ritual, which went through several editions in Venice, Amsterdam, Basel, Wandsbeck, Cracow, Frankfort-on-the-Oder, Zolkiev, etc. ; "Masoret ha-Ḥokmah," on the Ten Sefirot, and "Megillat Amraphel" on the merits of an ascetic life. 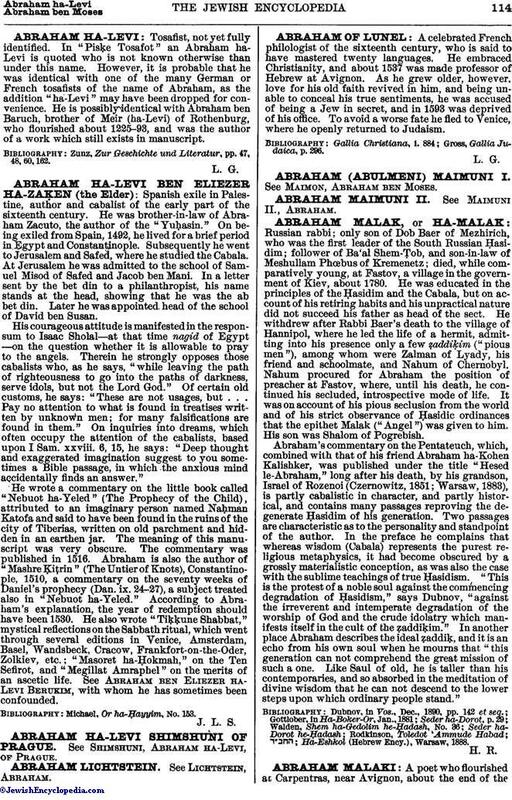 See Abraham ben Eliezer ha-Levi Berukim, with whom he has sometimes been confounded. Michael, Or ha-Ḥayyim, No. 153.